Efficiently operating from Palakkad, Kerala, Inter Search Recruitment Services is positioned amidst one of the most celebrated service providers presenting exceptional Manpower Recruitment Services. 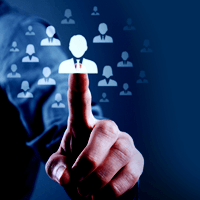 We efficiently select the appropriate employees for diverse companies across varied sectors. We are capable of bringing forth the finest and best results within budget and committed time span. Working under the vigil supervision of pool of professionals; under their guidance, we carry out stern sourcing and screening process that at first helps us to take on the deserving candidates for companies.